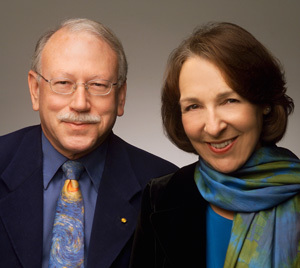 UC Santa Cruz physicist Joel Primack and his wife Nancy Abrams have been chosen to receive the 2012 Spirit of Rustum Roy Award from the Chopra Foundation. The award is given "to those making major contributions to the scientific understanding of consciousness and helping to move humanity towards a just, sustainable, healthy and peaceful world." Primack and Abrams will share the award with Dr. Rudolph Tanzi, a Harvard University neurologist. The award, which includes a $100,000 prize, will be presented in March at the third annual International Sages and Scientists Symposium in Carlsbad, CA. Primack is a distinguished professor of physics at UC Santa Cruz and director of the University of California High-Performance AstroComputing Center. He has been one of the leaders in the creation of the modern theory of the universe and the formation and evolution of galaxies. Abrams, an attorney, cultural philosopher, and lecturer at UCSC, has worked for the Ford Foundation and the Office of Technology Assessment of the U.S. Congress. Primack and Abrams co-taught a popular course called "Cosmology and Culture" at UCSC for more than a decade. They have also written two books exploring the cultural and philosophical implications of modern cosmology: The View from the Center of the Universe (Riverhead, 2006) and The New Universe and the Human Future (Yale, 2011). The Chopra Foundation, founded by Dr. Deepak Chopra, is committed to creating a peaceful, just, sustainable, and healthy world.